Home › Forums › Gear Forums › Gear (General) › Imusa 12cm Handle Mods? Has anyone modded an Imusa 10 or 12cm pot handle? I have the 12cm pot and like it but the darn protruding handle just bugs me. Any ideas on how to convert this to a folding handle?
. How to remove imusa mug handle? .
. IMUSA Pot Handle DIY Modification .
. Imusa Pot/Cup Handle Mod .
. BATCHSTOVEZ 12CM COOKPOT . 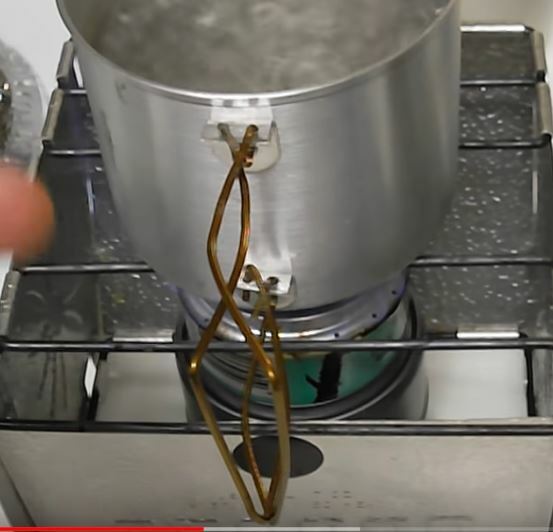 I am pretty sure that Sam (Batchstovez) stopped making pots in order to concentrate on stoves. shoot me a PM if you want any more details. @annapurna Thanks for the links. I wonder if the coat hanger will hold up at 36-40oz of water being poured. Maybe another option is remove the handle and put some kind of silicone wrap on the cup so it can be handled hot? My current handles are made of stainless steel bike spokes and they hold the water weight just fine. I made them of shirt hangers initially and those worked just fine as well. I changed out for the spokes because the shirt hanger was all I had st first, they could have rusted and I got my hands on a bunch of spokes off a rebuilt wheel. Do you have the specs on the dimensions on the bike spokes you used? I don’t have specs unfortunately… I literally stopped into REI one day and asked if they had rebuilt any wheels lately. The guy was working on a wheel and gave me the cutoff ones from that. I used to have access to a micrometer through work but changed jobs & moved 2 weeks ago so don’t anymore. i did the “full height” handle style on the smaller mug but opted for the shorter height/longer handle on the larger cuz I knew I wanted it to work fully inserted into a cone windshield/support. A full height handle makes that virtually impossible. Got around to moding my 12cm Imusa. Hacksawed the handle off, drilled holes and used coat hanger for handle. Not pretty but it works. I wish the coat hanger wire was a tad more stout but it does hold up to neary a full pot of water. The top rivet is a little loose. Any way to tighten this up without drilling and using small bolt/nut? 3.7oz without lid, 4.5oz with. This reply was modified 1 month, 3 weeks ago by Brad W.
Ordered mine from Minibull and they removed the handle, at my request, for no extra cost. I use a homemade cozy and have a carbon felt windscreen that is an excellent a pot grabber, so the handle wasn’t super-necessary and mostly would have just gotten in the way. Aware there are cheaper options out there but also as someone who’s not especially crafty, it was well worth the extra few bucks + shipping for a pot that works so well for me (cost like $7 + shipping). 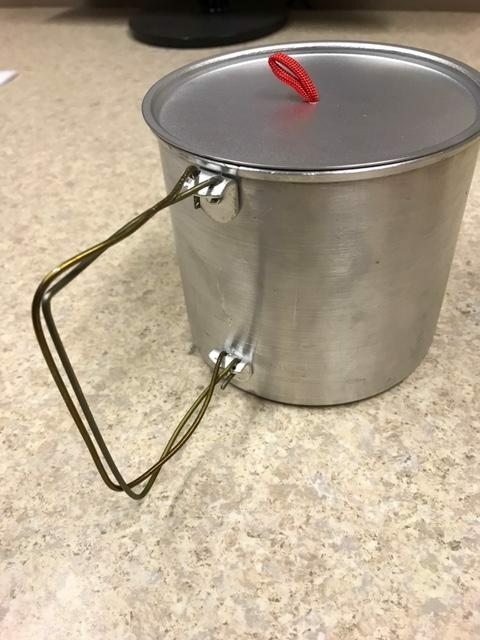 Could you permanently mount carbon felt on the pot as a grabbing point? Haven’t tried to since I like to use my felt as a windscreen too (I’m an alcohol stove person) and am unsure if it’d fit in a cozy with a permanent felt wrap. I’ve been told gluing fiberglass wick with JB Weld works well, so I would imagine you could plausibly do the same with carbon felt. – Imusa mugs are pretty cheap and you’d only be out $3 or 4 if your experiement doesn’t work. I’ve also seen those silicone bracelets used as a pot grab + lip protector. I don’t think there’s a way to tighten a rivet once installed. That (plus the fact that I didn’t have a rivet gun and didn’t want to buy one) was the biggest reason I used a small bolt, plastic washer and nut for my attachment. I’ve seen a fair number of guys wrap fiberglass wick material as a grabbing point… can’t think of seeing carbon felt. The wick should stand up MUCH better than felt. Various alcohol stove manufacturers wrap wick to absorb alcohol for priming. MiniBull does this on most of his Traditional Alcohol stoves. So you’d be assured that method would last. getting a silicone band big enough for a 12cm Imusa would probably be tough. I had some larger that fit on a Fosters can which was still smaller dia than the 12cm Imusa. The top rivet is a little loose. Any way to tighten this up without drilling and using small bolt/nut? Punch steel nail shank out, then use compression die in press. Yes, you need a custom die set for this, but I have done MANY rivets like that. Mind you, I use a plastic mug for drinking anyhow. This reply was modified 1 month, 3 weeks ago by Roger Caffin.